Update: Garena has issued a statement reversing, and apologizing for, the rule limiting LGBT players in its Iron Solari tournaments. "Our initial ruling on LGBT player restrictions within the Iron Solari League has created a lot of good discussion and debate over the past 24 hours. After discussing the ruling with our partners and re-examining our approach, we have decided to remove these restrictions completely. This means that any player who self-identifies as female will be allowed to participate. We sincerely apologize for any offense we caused to the LGBT and gaming communities," it said. "Our original intent when we put together this tournament was to promote diversity in the competitive gaming community. Hence, we are grateful to our players who have consistently provided their feedback to help us learn and improve as we strive to develop an inclusive gaming environment for all. We’ll also be keeping our promise of having an open dialogue with all parties as we plan this and future events," it continued. "We hope you will tune in to support these awesome teams and players in this upcoming tournament." Original: In the wake of a bizarre ruling by e-sports league Garena Philippines limiting the number of LGBT players who can take part in its all-women Iron Solari tournament, League of Legends studio Riot Games has issued a statement saying all players are welcome at its tournaments, and that it is working with its partners to "ensure consistency with our values across all regions." The trouble started earlier today when Garena Esports issued new rules for the second segment of its "all-feminine" Iron Solari tournament, which will now run on a monthly basis. It said that after discussions with various parties including members of teams who played in the first Iron Solari tournament, as well as "LoL players belonging to the Lesbian, Gay, Transgendered Women community," it has decided to place limits on the number of LGBT players who can take part. "Each team will be allowed to have a maximum of one (1) Gay/Transgendered woman for the entirety of the tournament day. Therefore, teams cannot do the following: Team_A's first game will be 4 female members and 1 gay, then on Team_A's second game, they will have 4 female members and replace with another gay or transgender member," the new rules state. "Any team who has violated the above provision, regardless if intentional or otherwise, whether discovered during the day of the event or some time after, will have all their team members (the female members as well as the Lesbian, Gay, Transgendered women member) sanctioned with a 1-year ban on all Garena-organized events, including subsequent Iron Solari Tournaments." 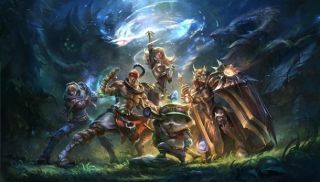 Strangely, Garena said it had imposed the new rules to help ensure "a more inclusive environment where no one feels left out." But it also claimed an obligation to ensure a level playing field for all, adding, "There are arguments and concerns from other participants who disputes that Lesbian, Gay, Transgendered Women members may probably have some unfair advantage." I cannot for the life of me imagine what those advantages might be, but the reaction was immediate and exactly as you'd expect: disbelief and, once it was confirmed as legit, strongly negative. That led Riot to issue its response on Twitter, affirming that all players are welcome at all times. "LGBT players are welcome at official LoL tourneys," the studio wrote. "We're working with partners to ensure consistency with our values across all regions." As it should be. We've reached out to Garena Esports for further clarity and we'll report back once we've heard from them.